Buying gifts for men is so difficult. You really can't get away with jewelry, flowers or chocolate so what the heck are you supposed to get them?! Between finding the perfect gifts for both my Dad and my boyfriend, I've come up with the ideal formula for a kickass man gift! Practical + Unique = Success! Here are a few gifts that meet this formula and are guaranteed to be a gifting success! I bought my boyfriend, Jimmy, a Roku after he had major surgery. I knew that he would be mostly confined to his bed for at least a week and the last thing I wanted was for him to get bored. So when I stumbled upon this streaming device called a Roku, I knew it was the perfect gift that he could use for a long time! 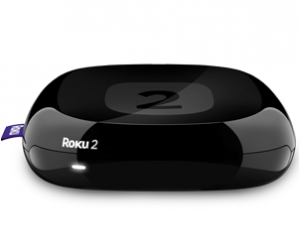 A Roku is like an AppleTV but so much cheaper. It's a small, lightweight device that connects to WiFi and plugs into virtually any TV. He can browse the internet, watch On Demand channels like HBO GO, ESPN or ABC on demand. Or, if he already uses streaming services like Netflix, Amazon or Hulu Plus, he can watch them right from this little device! My favorite part is how easily the Roku transitions from tv to tv. Basically, wherever there is WiFi and a television, he can enjoy your awesome little gift! What's more memorable than a once in a lifetime experience? That's exactly the idea behind Xperience Days. Search in your area to find discounted experiences that any guy would love! 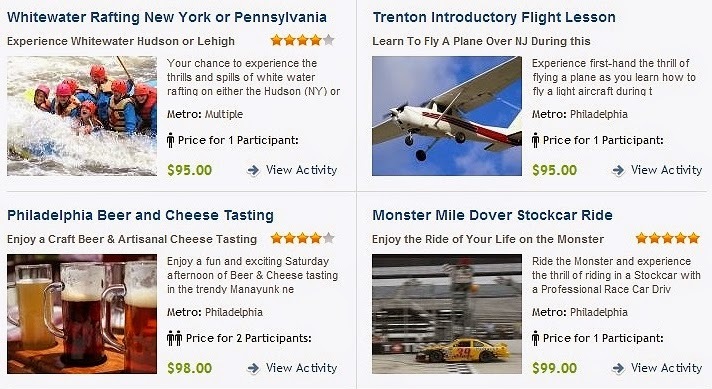 Choose from options like skydiving, piloting lessons, or a NASCAR driving experience with a professional driver! There's also a ton of activities for you to do together including cooking lessons, wine tastings, or hot air balloon rides. Any one of these experiences would be beyond memorable and totally unique. So you want to DIY? Sometimes, you have just don't have the money to buy large, extravagant gifts! I totally get it! 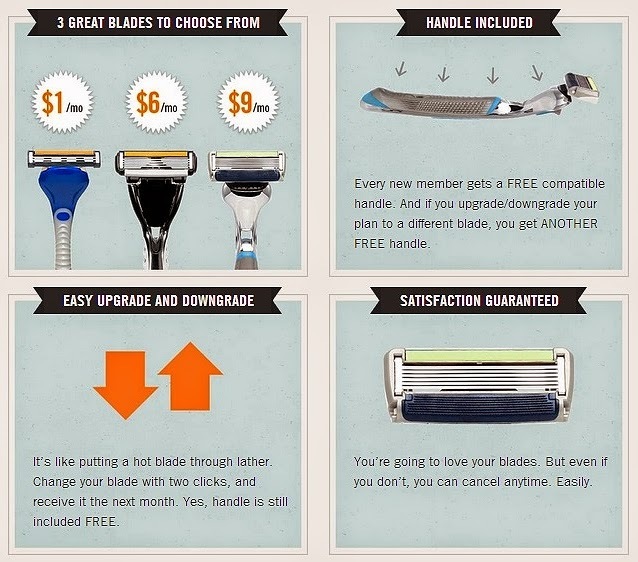 So how can you still give that special someone a great gift without spending a lot of money? Well I've been in the same situation and had to get creative with my gifting. Fortunately, with inspiration from other blogs and Pinterest, I came up with some AMAZING and inexpensive gifts that the men in the my life will NEVER forget! My boyfriend's 25th birthday was last month and I was totally stumped on what to get him. When 2014 rolled around we both decided to go easy on the birthday gifts this year. So my challenge was finding a gift that was easy and inexpensive, yet fun and practical. Well, once I got my creative juices flowing, I realized that his May birthday was the perfect way to kickoff summer. 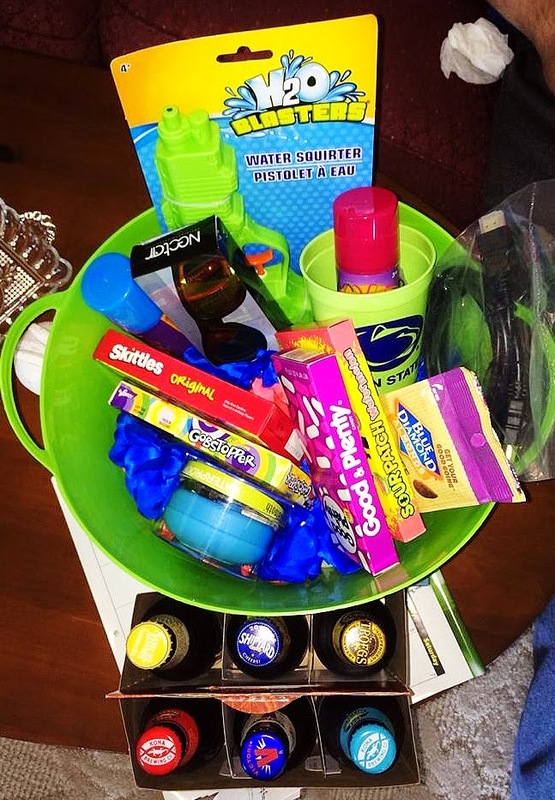 So using items that I bought mostly at the Dollar Tree and Wal-Mart, I put together a Summer Kickoff basket including things like candy, silly string, Nectar Sunglasses, a waterproof shower speaker and more! I also crafted my own six pack at Wegman's using all summer themed beers! Needless to say, he loved it! You could really create a basket like this with any theme at all in mind! This one's for the music lover in your life, and my Dad is definitely that! All I did was visit a thrift store and look through their records. Then, I found one I knew my Dad would like and appreciate. From there, all I had to do was set the record on top of a bowl and put it in the oven! 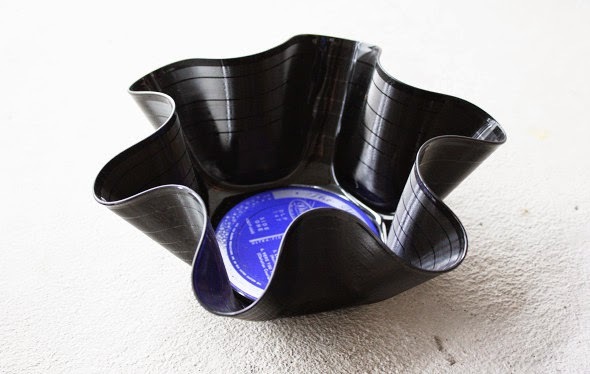 The records melts and once you take it out, it hardens into a bowl of its own! My Dad loved this gift! It's easy, costs only a dollar or two, and can be incredibly sentimental. Follow these instructions to make your own! Who doesn't love lollipops? 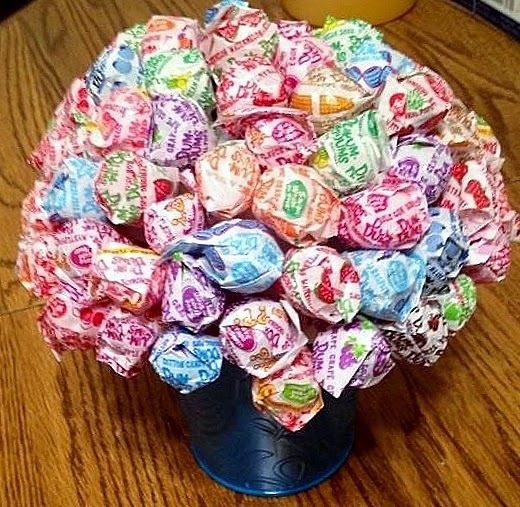 So many different flavors sure do make for a colorful bouquet. And those are exactly what I used to craft my Dad's birthday bouquet. 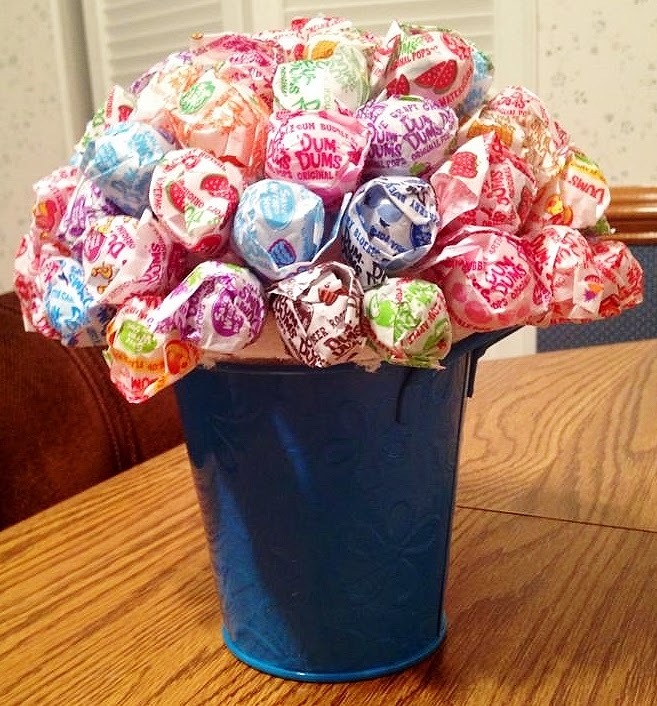 Using a pot and Styrofoam ball that I purchased from the Dollar Tree, I just stuck the lollipop sticks into the Styrofoam and voila- you have an awesome looking bouquet that anyone would love! It's beyond creative and so cute! This is definitely my favorite DIY gift for a man. In fact, I've made one for both my Dad and my boyfriend (who got totally jealous after he saw my Dad's!) The best part about this-- you can one hundred percent customize it based on the person you're buying for! My Dad's bouquet included things like small liquor bottles, cigars, lollipops, and bud light coasters. My boyfriend's bouquet included lottery tickets, Slim Jim jerky sticks, and gum. Attach each item to a stick (which are available in packs at Wal-Mart) using a pipe cleaner and stick it in a Styrofoam piece. Stick that piece in a large beer mug (which again are available at places like the Dollar Tree) and that's it! 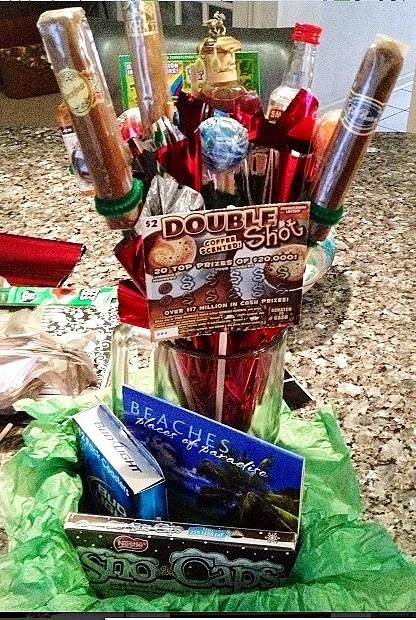 You have an AWESOME man bouquet that any guy would go nuts over. What amazing gifts have you gotten your men in the past? Any I should add to the list? 3 Bathing Suit Cover-Ups You NEED For Summer!